Mish's Global Economic Trend Analysis: Robotic Outsourcing; Food Preparation Robots Invade China, Japan, US; Who is to Blame, and What Can be Done About It? 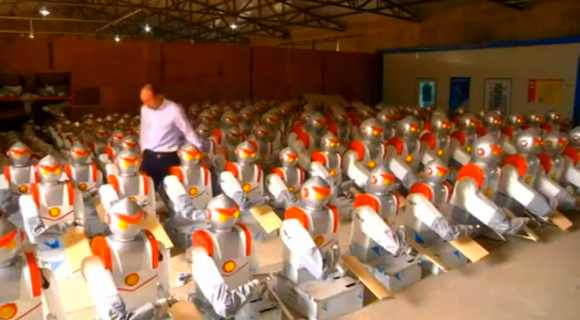 Robotic Outsourcing; Food Preparation Robots Invade China, Japan, US; Who is to Blame, and What Can be Done About It? From hamburgers to sushi to noodles, food robots replace workers in the US, Japan, and China. Noodle peelers should probably start looking for other things to do around the kitchen – there’s just no competing with these robots. Runguan’s robots peel noodle strips from a firm piece of dough and tosses them directly into boiling water “before diners’ eyes can follow the whole process.” While a cook doing the same job would make about 40,000 yuan ($6,400) per year, the robot cost just 10,000 yuan ($1,600). And no human chef can work so tirelessly. Price is already down from $2,000 this past August, which is no doubt a big reason why more than 3,000 restaurants that have already relegated their noodle-making to the robot. In Japan robots are already being used to make sushi, and a robot in San Francisco can serve up 340 hamburgers an hour. But while robotic cooks provide restaurants a novelty for customers and savings for owners, other robots are invading China’s workplace on a much grander scale. Most notably is Foxconn who, last November, began replacing 1 million jobs performed by humans with robotic automation. The metamorphosis is advancing quickly. In late February the company announced it put a freeze on hiring new entry-level workers. This was due in part to a high worker retention rate following pay increases, but it’s also a conscious decision to accelerate the automation of their factories. Who to Blame for "Robotic Outsourcing"
It's easy to see what is happening. But who is to blame, and what can be done about it? The simple fact of the matter is technology marches on and we all eventually benefit from it. To the extent it appears we do not, let me point out a six facts. The Fed (central banks in general) have made the cost of capital so cheap that it encourages employers to replace workers with cheaper alternatives. The Fed (central banks in general) can enhance trends, but cannot change them. Thus, I am not stating the Fed is the cause of "Robotic Outsourcing". Rather, I am stating that cheap money has accelerated that trend. Minimum wage laws, protectionism, unions in general, and inane government policies also encourage "Robotic Outsourcing". Long-term, everyone benefits from productivity improvements and associated cheaper prices. Unfortunately, Keynesian clowns as well as the clowns at the Fed (central banks in general) see cheaper prices as the enemy. In their effort to prevent falling prices, the Fed has lowered the cost of money so much that it is a no-brainer to replace human workers with technology at an increasing pace. Increasing the minimum wage encourages more outsourcing. Obamacare and other mandated benefits also encourages outsourcing. Outsourcing went first to Mexico, then to China, and now to robots. Manufacturing is returning to the US, but human jobs have not. The Fed (central banks in general) can enhance trends, but cannot change them. The Fed is not the cause of "Robotic Outsourcing" but cheap money has certainly accelerated that trend. With the Fed hell-bent on causing price inflation, Obama on causing wage inflation, and unions on keeping an unsustainable trend in wages and benefits, look for an accelerated trend towards elimination of human jobs.